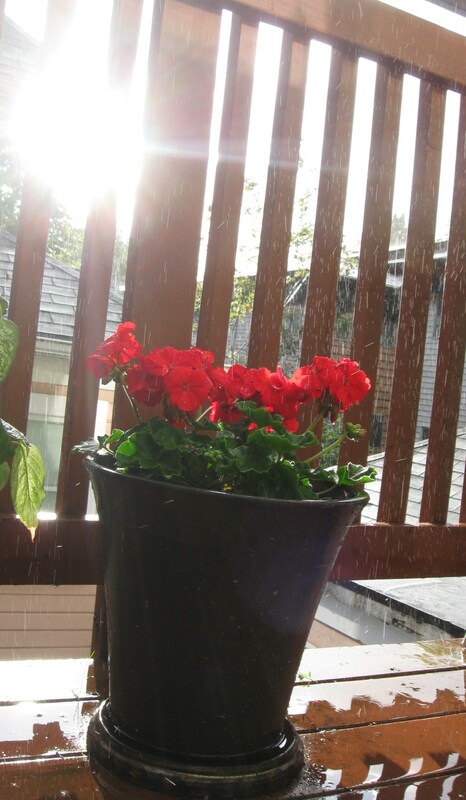 Another overnight rainstorm had pummeled the earth until leaves and flowers bent in surrender. The air smelled faintly of mud and lilacs as Nora opened her balcony doors to survey a brightening sky above roof lines and treetops. Two stories below her, the neighbors’ long driveway was filling up with tables and a couple of old chairs. Marty and his wife, Hanna, were setting up for a yard sale despite the iffy forecast. She thought about the boxes of shoes and purses she hadn’t unloaded yet. They gaped at her daily whenever she entered her bedroom; it was hard to let go of old, still-good leather products. She chided herself. They ought to be relieved of their uselessness and passed on. Nora set her teacup down on the tiny glass-topped table, dragged out two boxes, and started eliminating, haphazard pile growing. Then she consolidated the “toss” items and took them down to Hanna, who encouraged her to be generous with low pricing. She found the whole thing tedious and tiring, so retreated back to her balcony. People started to show up at eight-forty-five and for good reason. Marty and Hanna had a wide array of cheap offerings and customers rooted through books and old LPs, DVDs, jewelry and clothing. They admired a buffet and brocaded wing-back chairs. Nora noted that two pair of her shoes were bought. The garage held enticing cast-offs, from exercise equipment to older bikes to a 50-piece rose-covered china set the couple had avoided using for twenty years. Nora watched as she finished her muffin, licked her fingers. What did people want with so many used things? It struck her that the more one got rid of, the more one felt compelled to replace. She bet most of the shoppers had things falling out of closets at home. She picked up her cup and plate; she had work to do. Nora was turning to step inside when a flash of azure blue caught her eye. She looked closely at the clothesline strung across the drive. 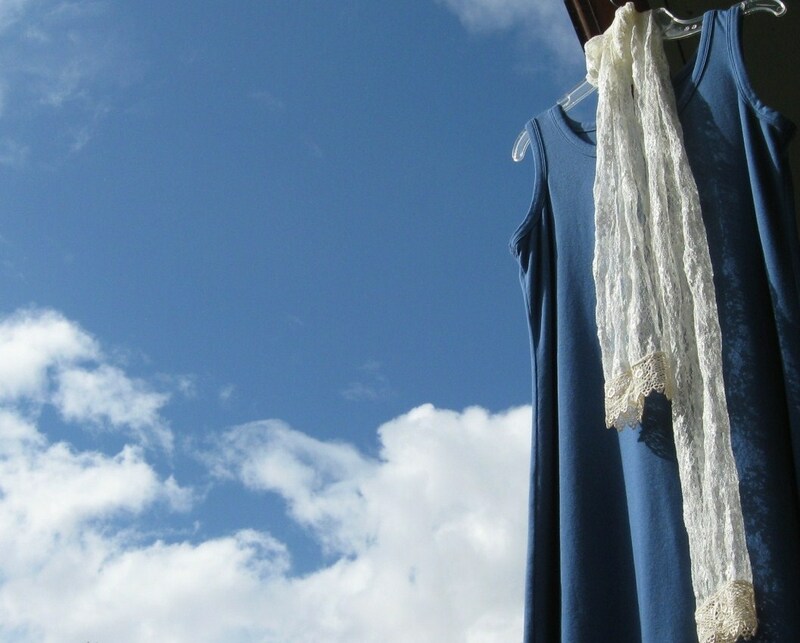 A long, sleeveless cotton dress hung at the end of the line, swinging in a the fresh breeze. An ivory lace scarf trailed from its scoop neck. A wave of shock raced through her. She ran downstairs, around the corner and up the driveway and when she reached for the dress, it was gone. Frantic, she searched the arms of several women in the cash-and-carry line. When it wasn’t to be found Nora walked to the garage and scanned the dim interior. And there it was: slung carelessly over the arm of a teen-aged girl in tight, raggedy blue jeans, flip flops and a loose, likely vintage black T-shirt with the band Guns and Roses on the back. She stood by a man who studied tools spread out on a piece of plywood settled betweentwo saw horses. Nora wanted to stop the young woman before she lost her chance but hesitated. It was only a used dress. She willed the girl to look at her but she continued to browse. When Hannah called out to Nora and asked if she might spell her at the check-out table, Nora reluctantly left the garage and took up her post. She watched three of her purses and another pair of shoes leave the premises. She was glad they were gone. The metal money-box was filling up nicely as she waited for Hanna’s return. The more Nora thought about the dress–its soft, graceful lines with the exquisite lace scarf–the more she needed it. When she looked up again the teen-aged girl stood before her. She put her finds on the table: three leather purses, a crock pot, gold-trimmed glass coffee carafe, four woven place mats, a pearl-embellished sweater. And one long blue dress with scarf. “Looks like you’ve done well today,” Nora said, breathing shallowly. Nora looked at the rumpled wad of bills in the girl’s hand and then at the dress. Only ten dollars on the sticker. How could something like that be had for so little? She stood up. The teen-ager examined the scarf and whistled. “Wow. Citrine. A very sweet name. Different.” She smoothed the rich blue cotton of the dress. Hanna touched Nora on the back. “I’ll take my spot back. Thanks. Isn’t it great the sun came out! I guess you’re all set to buy?” she asked the girl. But Nora was walking down the driveway, trying to stand tall and not run, stifling the urge to scream at the ignorant girl, the careless neighbors who put out that dress, the wretched wet flowers. She had been blind-sided, that was all. She wasn’t expecting the dress to show up, to remind her. She held Citrine’s dress out to Nora, then put down her bag of items and wrapped Nora in her thin arms. They stood that way as the lilac bushes whispered nothing of import and raindrops shook free from above and wet their hair, with one blue dress and delicate scarf safe between them.